While most mushrooms are available year-round, fall and winter is considered peak mushroom season for many popular varieties. Enjoy your favorite fungi at the height of its deliciousness with these umami-rich recipes. Think your Ragu has to filled with ground beef? Think again. While traditionally a meat sauce, we’ve developed flavors and textures in this sauce with multiple varieties of mushrooms. Serve a loaf of warm bread to sop up all the saucy goodness of this pasta dish. Use a Parmesan rind in your Ragu, soups, and stews to subtly infuse the dish with the flavors of the cheese. If the rind doesn’t dissolve during the cooking process, you can remove it from the mixture, as instructed in this recipe, or break it up with a fork into small, chewy pieces. While any pasta shape will work with this hearty vegetarian dish, we prefer penne or ziti; these noodles help capture every last bite of the chunky sauce. If you’re a mushroom-lover, this is the pasta dish for you. 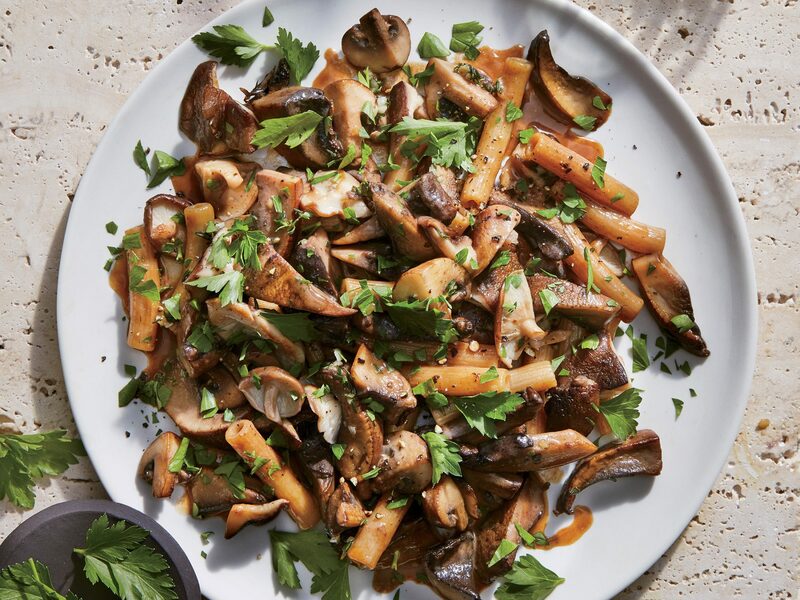 It’s chock-full of three kinds of fresh mushrooms (2 pounds of them) that contribute their own flavors and textures—meaty, hearty portobello; super savory, tender shiitake; and earthy, chewy cremini. We cook them in stages so the tougher mushrooms cook longer and the more delicate shiitakes cook less so they hold their shape. The touch of crème fraîche in the sauce gives the dish a stroganoff-like flavor; substitute full-fat sour cream if you can’t find it. Grain bowls are so popular for good reason. They're the perfect solution for a fast weeknight meal. This vegetarian spring grain bowl has all the elements: pleasantly chewy farro, tender-crisp spring asparagus and fennel, and a big punch of flavor from lemon and Parmesan. Serve warm on a cool night or make it ahead and dish it up cold the next day. Look for precooked, ready-to-heat farro near other shelf-stable prepared grains. To make your own farro: Cook 1 cup dry farro in a pot of boiling water until just tender; drain well. For a little extra protein, top this dish with shredded rotisserie chicken. Roasted mushrooms are a revelation--intensely savory yet still tender and juicy. Use cremini or baby bella mushrooms here; white button mushrooms are too mild. Instead of roasting a whole pork tenderloin or slicing and searing, try giving it a coarse chop in the food processor for incredibly rich and tender meatballs. Because the pork is so lean, the meatballs cook in just 8 minutes. Broccolini, a cousin of broccoli, have long stalks and small buds; they'll add plenty of texture to the rice mixture once sautéed and chopped. Sriracha can be found in any grocery store and is worth keeping in your pantry. The chile kick and vinegar tang can perk up tacos, noodle soups, and stir-fries. You don't need to have cooked a beef roast to make this full-bodied sauce. The richness comes instead from sautéed mushrooms and red wine. Spoon the sauce over steak or a baked potato topped with blue cheese. After just one bite, it's easy to get hooked on this flavorful, 5-ingredient, hummus topper. Season with salt and pepper to taste and serve with toasty baked pita chips, if desired. Lose weight the 5:2 way. This healthy, quick and easy recipe is featured in the breakfast section of the new 5:2 Starter's Guide to The 2-Day Diet. The book provides a selection of over 100 tasty recipes that meet the daily 500 calorie allotment for the 2 days of intermittent fasting, as required by the 5:2 Diet. A great option for a meatless meal, this grilled panini sandwich features sautéed mushrooms, roasted red peppers, and gruyére cheese. "When creating a side dish, I like the sauce to have a good punch, especially if it's accompanied by something that could stand on its own," says Chris Clime. To make this dish even more flavorful, you can leave the cooked mushrooms in their juices overnight to continue marinating. When you're ready to serve, heat them in a dry, hot skillet and cook until they start to get slightly golden brown and crispy. Half the pleasure of a frittata is just saying it. Go ahead. Free-tah-tah. For molto fun, say it Italian-style: Stress the first syllable and roll the r. Fr-r-r-r-r-r-r-r-ee-tah-tah. Brava, bella. A cast-iron or carbon-steel pan is best here because it goes under the broiler, and high heat could damage nonstick skillets. Handy advice: If you set out to make an omelet but your pan won’t release the eggs and they stick to the bottom, just spread out the fillings, pop it under the broiler, and presto! Frittata. You can easily make this dish for 2 or 4 people using a larger pan and multiplying ingredients accordingly. A container of mushrooms may seem like a lot, but they will shrink considerably--and their flavor will intensify--when roasted. Use a stainless steel pan instead of a nonstick here, if possible. A stainless surface will better collect fond (also known as browned bits) from the pork, which is then deglazed to lend rich flavor to the mushrooms and onions as they cook. Go low-carb with hearty spaghetti squash in place of pasta. Cook an extra squash, and store the flesh in ziplock bags for a quick side during the week. For maximum flavor and chewy-soft texture, the mushrooms are roasted and then simmered in broth. 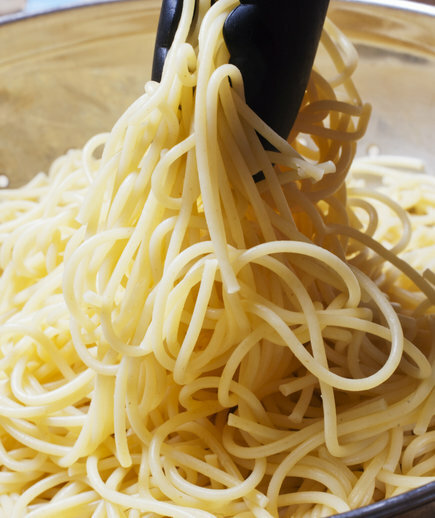 Save a bit of pasta water to moisten each bowl before serving. For a satisfying vegetarian main, omit the bacon; instead, sauté the vegetables in 2 teaspoons olive oil, and sprinkle pizzas with 1 ounce shaved Parmesan cheese for a hit of salty, savory flavor. The kids will love these mini pizzas, and they'll never know that the crust is a whole-wheat pita. If you've got leftover pitas, grind them up for breadcrumbs. A gentle poach keeps the chicken breast moist and tender, so it's easy to pull apart. The lime in the yogurt mixture will intensify over time--combine just before serving. While the miso, a fermented soybean paste, is optional, Acheson likes it for its savory depth. Miso is available at Publix and most major supermarkets. We recommend eating this on a romaine salad, as a garnish for a Bloody Mary, in an omelet, or minced into ground meat. Serve this hearty, comforting beef dish over a bed of jasmine rice or mashed potatoes--you'll definitely want something to soak up the rich sauce. At less than 200 calories per serving, you can feel good about serving this comforting salisbury steak meal to your family. Sandwich night gets turned up a notch with super fast Mushroom and Manchego Panini. This flavor-packed grilled sandwich is made with fresh herbs, a mixture of exotic mushrooms, and shaved cheese--all sandwiched between sourdough bread. Mushroom Puffs are a quick and easy appetizer that your friends and family will love. One online reviewer says, "Very tasty and easy to make!!" This easy chicken recipe is quick to make, comforting to eat, and low enough in calories for a guilt-free dinner tonight.